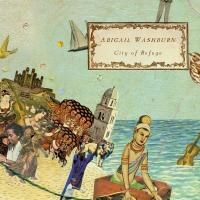 There’s a tune on Abigail Washburn’s debut that I’ve kept returning to since I first heard it. Called “Backstep Cindy / Purple Bamboo”, it’s an old-timey banjo tune that, halfway through, morphs into a traditional Chinese flute piece, arranged in this case for banjo, fiddle and cello. Like the best of Washburn’s work, the tune gracefully bridges a gap between the traditions of two different cultures. It’s fusion in the truest sense of the word. For Washburn, fusion is a way of life. She’s a truly multicultural person, living and recording in Nashville, but touring and teaching in China; fluent in both English and Mandarin. It’d be a mistake to pigeonhole her as a Chinese/bluegrass schtick artist, though. Her scope is global and her musical appetite is boundless. She founded, with husband Bela Fleck, the progressive bluegrass chamber group The Sparrow Quartet and collaborated with hip-hop artists on a found sound/electronica project to benefit survivors of the Sichuan earthquakes. I admire her for her willingness to try anything, but her most rewarding works to date -- and, ironically, her most successful attempts at fusion -- have been her most strictly traditional, whether old-timey or Chinese. It’s a cool reminder that even experimental music is done best when it’s deeply rooted in tradition. For her latest, City of Refuge, Washburn has chosen a new crop of eclectic and high profile collaborators, including guitarist Bill Frisell and guzheng player Wu Fei. Most of the buzz in the folk press, however, has been about her choice to reach out to several artists in the indie rock world: The Decemberists’ Chris Funk, My Morning Jacket’s Carl Broemel and, most notably, Nashville songwriter Kai Welch and Portland producer Tucker Martine (The Decemberists, Laura Veirs, Erin McKeown). While there’s nothing particularly new or exciting about indie/ folk crossovers, this collaboration is an inspired move for two reasons. The first reason is songwriting. When Washburn’s fallen short in the past, it’s been because her expansive vision is beyond the reach of her songwriting voice. She’s always been at her best as an old-timey folk singer, and her experiments beyond that realm, while admirable, haven’t always succeeded. Here, Welch co-writes half the album’s tracks, fully fleshing out ideas -- like the lazy, Eastern-tinged chamber folk of “Bring Me My Queen” or the AM-radio folk-pop of “Chains” -- that may have seemed half-formed on previous albums. This allows Washburn to be her old-timey self while Welch’s more varied musical vocabulary fills in the gaps. That brings us to the second reason: context. Washburn’s M.O. as an artist has always been cultural exchange, and City of Refuge is no different. This sets it apart from other indie/folk crossovers because Washburn recognizes indie rock as its own tradition with its own set of rules: namely, careful attention to texture and a command of an eclectic array of genres. Throughout the record, Washburn stays in her territory and lets her collaborators respond from theirs. This is not a bid for relevance or wider appeal, nor is it a betrayal of her traditional roots; it’s a conversation. And it’s a conversation that gets interesting. For instance, check out the killer combo that closes the album. “Divine Bell”, a co-write with Old Crow Medicine Show’s Ketch Secor, is the most old-timey thing here, a true country gospel tune about the end of suffering. Not only is it explicitly Christian, it’s pretty Dispensationalist, and its regionalism is pitch-perfect, both in eschatology and twang. Then, closer “Bright Morning Stars” is an Appalachian folk song that Washburn, Secor and fellow Old Crow Morgan Jahnig sing in Sacred Harp-style acapella. It’s not a hymn, though -- it’s a mourning song -- and its more inclusive vision of hope is given startling depth by Washburn’s choice to superimpose it over throat-singing by Mongolian string band Hanggai. That one-two punch poignantly closes a record about homesickness and community on a note of provocatively spiritual -- and entirely global -- uplift. Despite her music, Washburn will be pigeonholed and overlooked. She’s a chick folk singer, after all, who plays old-timey banjo and has expanded her palette to include lush indie rock production, none of which makes her especially fashionable. She’s not as rich a storyteller as Patty Griffin, nor does she have Gillian Welch’s sheer command of the American songbooks. But with City of Refuge she’s establishing herself as a representative from her genre in a multicultural conversation about globalism and history, which places her more in a league with artists like Amadou & Mariam. Like the Malian couple, she’s a fiercely talented musician with omnivorous taste and a strategic eye for collaborators, and like them, she’s a dreamer with vision. Here’s hoping the big, wide world she loves so much takes notice.